An additional organic coating is often applied to zinc-coated steel substrates to provide protection to the steel surface or alter its appearance for aesthetic purposes. Prolonged service life, durability, and good weathering properties are expected qualities of these organic coatings as they are often applied outside. The organic material’s elemental and chemical composition decides the required properties to a specific organic coating to function as a protective layer to the steel surface. X-ray Photoelectron Spectroscopy (XPS) yields chemical bonding data from the top few nanometers down to many microns in depth of a surface. This analysis technique is suitable to determine the carbon functional groups in an organic coating. Although XPS is incapable of detecting hydrogen, the complementary Reflection Electron Energy Loss Spectroscopy (REELS) technique has the ability of hydrogen detection and measurement. Aliphatic and aromatic carbons can also be discerned using REELS. 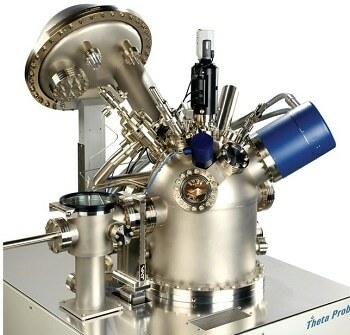 The Thermo Scientific Theta Probe is a combination of XPS and REELS. This multi-technique surface analysis system also features the additional method of Ion Scattering Spectroscopy (ISS) as standard. In this experiment, the full chemical and elemental composition of an organic coating applied on steel was determined using the Theta Probe. Hydrogen concentration was also determined as part of the analysis. The 25 µm-thick polyester-based coating consisting of hexamethoxymethyl melamine (HMMM) as a cross-linker (Figure 1) was analyzed in this experiment. A shallow-angle cross-section of the coating was prepared using ultra low angle microtomy (ULAM), facilitating depth profiling of the organic coating with the help of XPS and REELS linescans across the sample. Figure 1. Structure of polyester polyol (R1 is an alkyl functional group and R2 are aromatic or alkyl groups) and HMMM cross-linker. Wide scan XPS survey data collected at every point on the linescan determined all elements present, from the organic coating surface, down through its thickness of 25 µm and ending in the zinc-coated steel substrate. The XPS data quantification yielded the sample’s elemental profile (excluding hydrogen) as a function of depth (Figure 2). The HMMM cross-linker is the only reason for the observation of nitrogen in the organic coating as the polyol is a nitrogen-free polyester. Figure 2. Elemental profile (excluding hydrogen). From the elemental profile, a significant depletion in the HMMM concentration is observed in the ~5 µm region of the surface of the organic coating. The average concentration of nitrogen in the bulk of the coating is 3.0 At%, in proportion to a polyester: HMMM Wt% ratio of 6.4: 1. The carbon bonding was determined as a function of depth by acquiring high-energy resolution carbon spectra at every point along the linescan. Two distinct zones were identified in the organic coating in the XPS elemental analysis: HMMM-rich and HMMM-depleted. Figure 3 shows the carbon spectra obtained from these two regions. Figure 3. Carbon C1s spectra from HMMM-rich and HMMM-depleted zones. Peak fitting of the C1s spectra acquired with the Thermo Scientific™ Avantage data system showed the existence of C-C/C-H, C-O, N-C-O and C=O bonding. A significant aromatic carbon concentration was also observed in the HMMM-rich region. The presence of the aromatic ring in HMMM (anticipated at 288 eV) is the reason for this carbon state having a very low binding energy. Alternatively, the binding energy is assigned to increased aromaticity in the HMMM-rich region of the polyester material. Figure 4 shows the carbon bonding states that were measured as a function of depth, allowing the change of chemistry to be monitored as a function of depth. The N-C-O bonding state profile from the high-resolution data shows good agreement with the nitrogen elemental profile, corroborating the rise in HMMM cross-linker concentration towards the metallic substrate. Figure 4. Quantification of carbon bonding states as a function of depth. Complementary data to the XPS analysis was obtained by performing a REELS linescan on the cross section of the organic layer (Figure 5). Hydrogen was quantified, and the change in aromaticity was analyzed as a function of depth by directly analyzing the REELS spectra. Figure 5. Data from REELS linescan showing features due to hydrogen and aromatic carbon. The elastic scattering of electrons from the sample results in the strongest peak observed in a REELS spectrum. 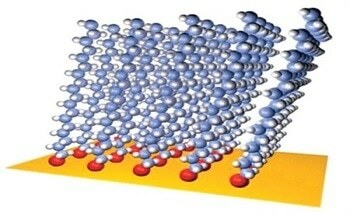 The interaction of electrons with hydrogen atoms in the organic layer is the reason for the small peak observed at the base of the elastic peak. Hydrogen can then be quantified versus all non-hydrogenic peaks by simple peak fitting of this shoulder versus the elastic peak. This data was coupled to the XPS quantification to provide a total elemental quantification across the coating (Figure 6). The hydrogen concentration drops towards the metallic substrate with increasing HMMM cross-linker concentration. A battery of known polymer samples was used to confirm the methodology for hydrogen quantification. Transitions in the organic materials’ aromatic bonding system can be promoted by the core electrons from the C1s level exiting the sample when subjected to X-rays. 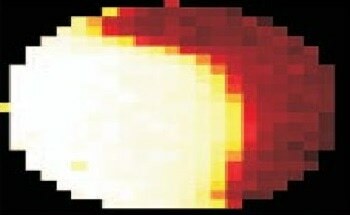 Weak, broad satellite features can be observed due to these transitions (from the Π-HOMO level to the Π*-LUMO) in XPS that appears several volts to the greater binding energy of the main C1s peak. Although the same transitions can be observed in REELS spectra, they are normally sharper, stronger, and easier to analyze. The intensity of the Π*-Π feature within a REELS spectrum is associated with the aromatic carbon concentration in the sample. The energy of the same feature is an indication of the polymer’s valence electronic structure. REELS data obtained from the polyester/HMMM cross-linker sample reveals a drop in Π*-Π intensity towards the metallic substrate (Figure 7). This indicates a rise in the aromatic carbon concentration with depth. From the high-energy resolution XPS analysis of the carbon chemistry, it can be observed that the HMMM cross-linker was not fully responsible for the increased aromaticity in the HMMM-rich region. This can be confirmed from the results of the REELS analysis of the organic layer (Figure 8). The energy of the Π*-Π peak seen in the REELS spectrum obtained from the HMMM-rich region various from that of pure HMMM and is, in fact, consistent with phenyl groups present in a polyester material. Figure 8. REELS spectra from pure HMMM and HMMM-rich zone of the organic coating on steel. An organic coating applied on steel was comprehensively analyzed by performing a combined XPS/REELS analysis using the Thermo Scientific Theta Probe. All non-hydrogenic elements were quantified using the XPS data, enabling the carbon bonding states to be studied. The complementary REELS data quantified the hydrogen concentration. REELS was also used to study the difference in the concentration of the aromatic carbon through the organic coating.